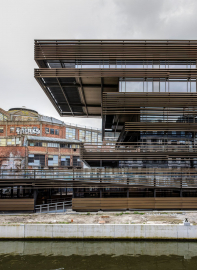 De Krook is the new city library of Ghent, intended as an ‘open house for knowledge and innovation' and cultural catalyst to the city. . The stark metallic structure lies along the waterfront and offers an interesting contrast with the surrounding historic monuments. What used to be a neglected corner of the city is now a 'balcony to the city'. 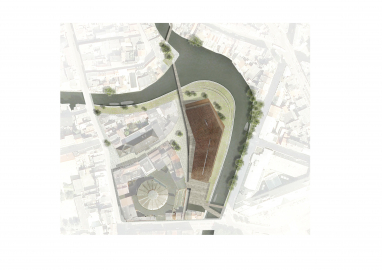 When the city of Ghent organized a contest in 2010 for a new city library, the city had a rather extensive wish list. 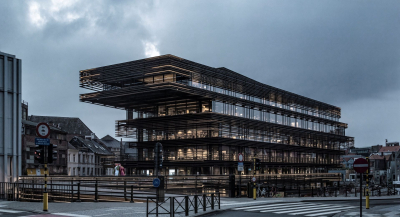 The new building had to house a library, meeting rooms and a café overlooking the city, as well as offices and laboratories for the University of Ghent and a center for new media (IMEC). Yet the new building also had to become a worthy architectural sparring partner of Henry Van de Velde’s nearby masterpiece the “Boekentoren” (book tower) - the university library -, as well as play a vital element in the regeneration of the dilapidated neighbourhood as a place of gathering for local residents. 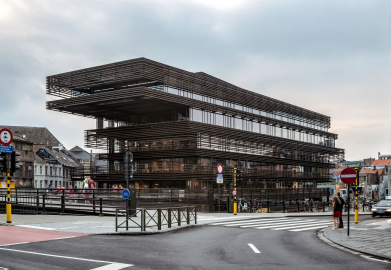 The design of de Krook - with its visible steel construction organized as a stack of stark horizontal plateaus - certainly makes a bold architectural statement. The building lies beside the river the Scheldt, the stream that reaches its lowest point here on its journey through the city and in doing so makes a bend, or ‘krook’ in old Dutch (hence the name of the site). The architects chose to mirror this kink in the design of the building, thus optically reducing the volume of the building and allowing more communal areas and greenery alongside the building. Inside a double height agora is multiplied on the upper floors creating a flow of vertical and horizontal relations, while the intimate, homely atmosphere bathed in soft filtered light is combined with a wide-open view of the city or – depending on the floor level - the bustle of the riverside. 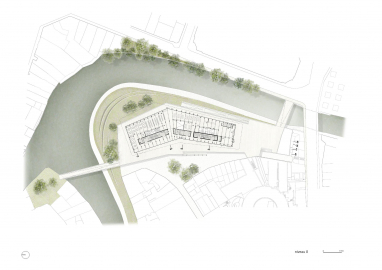 Outside two new bridges allow pedestrians and bikers easy access to the platform, thus creating a new passageway, welcoming visitors and locals alike. 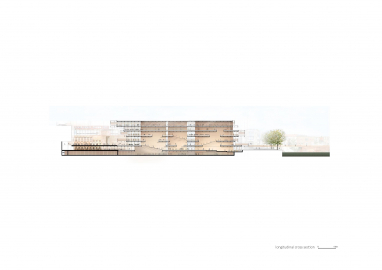 The aim of the building is to create a city within a city and at the same time make a fluent connection with its actual surroundings. 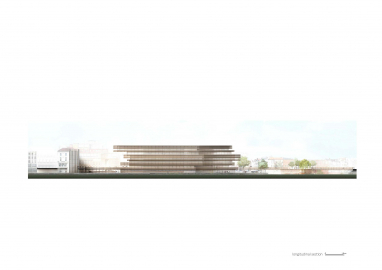 As a first and crucial step the architects decided to elevate the level of the main entrance so that the building is more connected into the urban fabric. Inside the building mimics a city with its streets, squares and public meeting-spaces. The physical link with the surrounding city is created by means of attractive views across the urban landscape, thus creating a visual connection between inside and outside. The building is therefore extremely transparent and open, allowing local residents to meet here once again and discover what this reclaimed location has to offer. The interior is kept fairly dark, on the one hand this enhances the visual display of the views towards the city but on the other hand the relative darkness has an interesting effect on the level of sound. The ceiling consists of lamellas, allowing for excellent acoustic absorption, but is the softness of the light which brings about the subjective experience of quietness. 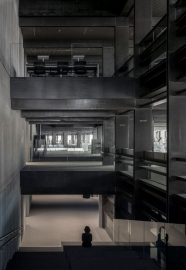 The materials of the Krook library are stripped to its essence: construction materials metal and concrete remain unembellished and given free reign to play the role as protagonists in the final appearance. Both Coussée & Goris architecten and RCR Arquitectes are both influenced by the Arte Povera, they both urge on an honest approach towards the material. Opting for this practice of rawness where construction materials are left exposed, demands an immaculate finishing, with a high sense for technical detail and precision. Yet at the same time this practice benefits the sustainability and the building costs, both of the building process itself and the maintenance of the building on the long term. 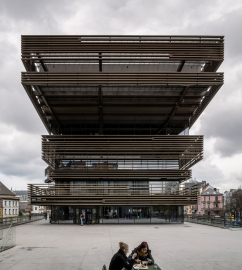 The building is entirely constructed out of prefabricated metal elements. Because 85 percent of all materials could be transported over water to be delivered on site, the city was also preserved from a possible transport nuisance.